Thursday 26 May at De Boerderij, Zoetermeer (sold out), Friday 27 May at Kubus, Lelystad. and all are served by the major international hub of Amsterdam’s Schiphol Airport. To mark the band’s return to The Netherlands – where Procol and Gary Brooker have a long-standing and loyal fan base – 'Beyond the Pale' has planned an excellent party for Thursday 26 May. The reservation links for this are above, and booking will be on a first-come first-served basis. This International Convention, like BtP's other major parties – September 2000 (Guildford, UK); May 2001 (Kristiansand, Norway); June 2001 (Manchester, UK); July 2003 (Hollywood, USA); August 2006 (Lejre, Denmark); July 2007 (Smith Square, London); April 2013 (Wuppertal, Germany); July 2014 (Westbury NY, USA) – takes place because fans are naturally congregating to hear Procol Harum play, and the pleasure of that is enhanced by making/meeting friends beforehand, trading stories, showing memorabilia, eating and drinking together; and then more of the same afterwards! Many significant friendships have formed in such a way: you'll be meeting people who share your lifetime's love of some eternally great music. Jens and Roland have been busy – in grateful collaboration with good friends in the area, principally Hans Tammes and Frans Steensma – making the arrangements necessary to ensure that everyone coming to hear Procol Harum has an extra-specially memorable and friendly time. 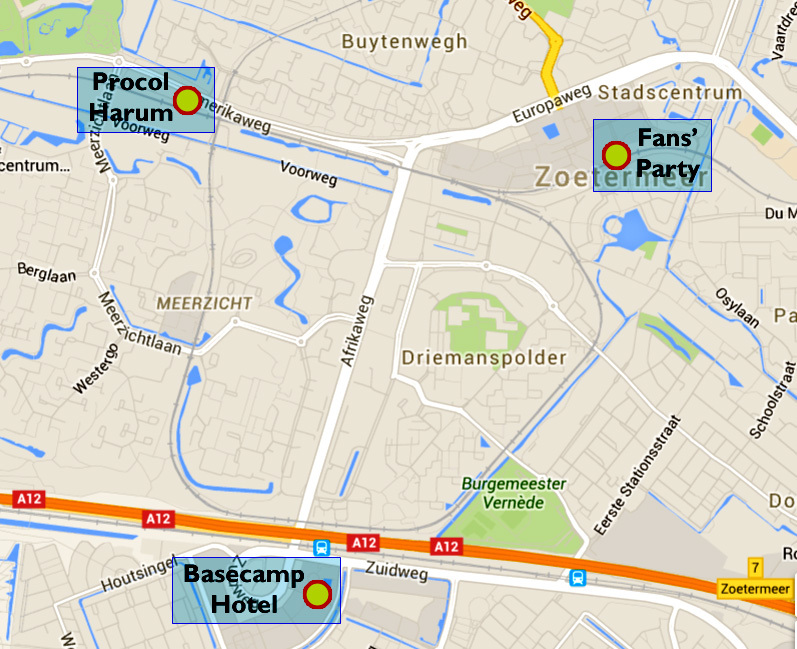 The fans' party will take place at ‘Clooney's’, a popular restaurant in the heart of Zoetermeer. Before Procol’s show you will be able to gather with friends old and new, and you’ll be served a good three-course dinner. In addition to the primary aim – having a good time with fellow-fans – you’ll hear a fascinating presentation (in English) by Procol historian Frans Steensma, and there will be ‘unplugged’ performance of songs you will certainly recognise! After the Boerderij show, the party resumes at Clooney’s, and Procol Harum and crew are top of the guest-list. During two reconnaissance visits in recent weeks, ‘Beyond the Pale’ has negotiated the usual, special discount deal with a Basecamp Hotel nearby, so that all fans may stay together, in comfort. (Fans wanting to stay on and explore historic Amsterdam may choose an extended Basecamp Hotel booking, because accommodation in the capital is much more expensive). The three venues in Zoetermeer are close within a compact area, but for fans’ comfort and convenience BtP has hired a charabanc (‘bus’) for 26 May so we can all relax, not worry about directions or tickets, and continue the party atmosphere as we travel together. The key locations, shewn on the map adjoining, are closely grouped, but it's not walking distance. 3. Procol Harum gig > Fans' party. To return to the hotel at 'the end of the evening' – which means different times to different people – shared taxis will work out economically; trams will also be running. More guidance about this in due course. • 15.00 to 19.00: the party! A very nice, seated three-course dinner, chosen in advance by you (meat, fish and vegetarian options: the menu ) ... to set you up for the Procol gig later. 17.00 hours: the meal will be served at 17:00, but will still be available at 18:00, to suit people who can join in only after office hours. Live ‘unplugged’ music from a new, slimline incarnation of The Palers’ Band. • 19.00 Charabanc takes us to Procol Harum’s concert at the famous Boerderij – where they last played in 2003 and 2002. For this concert you need to book your own ticket: the Convention price doesn’t include the Procol show itself. • After the show, 'get back on the bus' to Clooney’s, where the party will continue until 1 am. Four more drinks of your choice (soft drinks, coffee, wine or beer) are included in the Convention price. The cash bar will again operate in addition. The Convention is priced to cover costs: BtP is not a commercial organisation and we have done everything we can to ensure excellent value. Fans who have enjoyed our previous parties – September 2000 (Guildford, UK); May 2001 (Kristiansand, Norway); June 2001 (Manchester, UK); July 2003 (Hollywood, USA); August 2006 (Lejre, Denmark); July 2007 (Smith Square, London); April 2013 (Wuppertal, Germany); July 2014 (Westbury, New York) and many other less elaborate affairs – will already know this, but of course we also expect many first-timers on 26 May, and assure them an extremely warm welcome. As someone memorably said, BtP's parties are 'where old friends meet for the first time'. Your ticket (in the form of a souvenir badge which you’ll collect and wear at the venue) pays for: pre-show party, after-show party, three transfers in our hired bus, three-course seated meal, eight drinks, live music at Clooney's, Frans Steensma’s presentation, and – best of all – wonderful company. The Convention ticket-price doesn’t include the Procol show at De Boerderij, nor your accommodation at the Basecamp Hotel: these you will book separately – see links at the top of this page. We look forward to seeing many Procol fans at this excellent location on 26 May 2016!